Annie’s Monday morning brain teasers are all about the color blue today. Whether blue is your favorite color or you are feeling a bit blue because you have to work on Presidents Day, we can take heed in what Vincent van Gogh said about this color. “There is no blue without yellow and without orange.” The true or false answers slated for tomorrow’s post, Tuesdays with Annie. Blueberries should be pruned in May. Blueberries have a deep root system. The best time to plant blueberry bushes in the Northeast is early spring, after the threat of a hard frost. Planting more than one variety of blueberry is important for cross pollination. 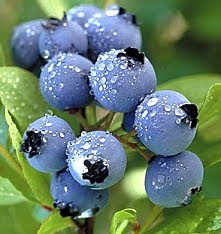 Image of blueberries from Internet.